William Hill offers betting on several political markets. Some of them are so far off that most people don't pay them a second glance, but the site has made them available for you. William Hill has been in the betting industry for nearly 100 years and it still remains the favorite bookmakers for many people around the world. It is a reputable brand that has earned the trust of gamblers. It has been listed in the London Stock Exchange since the year 2002 and continues to grow strong. It employs over 18000 people who are based in Bulgaria, Israel, UK, Ireland and Gibraltar. The operation of the sportsbook was moved from the UK and is now in Gibraltar. The site is quite convenient to navigate with very fast loading and emphasis on In-Play markets and current promotions on the homepage. 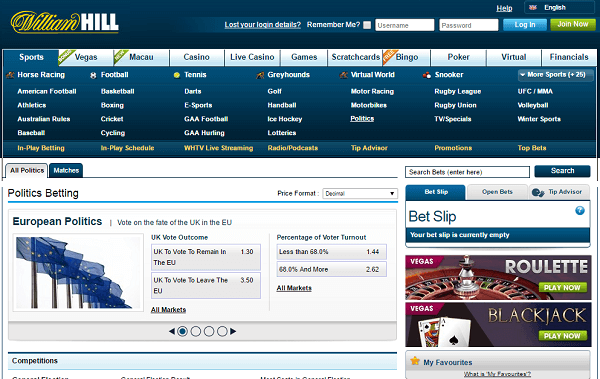 The William hill politics markets especially general elections are easily found on the homepage. Others are found through a menu found at the top of the page. The large varieties of markets available at the website are just spectacular; ranging from sports events to politics. It focuses on the British and American elections just like other political betting sides but it is important to note that William hill politics odds are much more competitive compared to the rest since they are very cautiously prepared by a team of professionals trained to be error proof. The kinds of markets given are even surprising. The 2020 general election of the UK is available on the market despite being four years away. The William hill political betting is undoubtedly superior to others like Bet365 and Paddy Power. You can stake a sizeable amount without any restrictions. The William hill politics odds can be guides to the prevailing wave that the actual election is taking. Odds have proven to be more accurate than the polls and some pollsters have suffered great embarrassment when their opinions have differed totally with the actual results of the election. Well only their credibility will suffer a big blow and they will be back in business come the next general election. The bookmakers however do not have this privilege; a mistake in the award of odds costs money hence the accuracy and precision employed to it is second to none. In addition, the odds are always calculated with reference to other competitors in the industry hence a conspicuous difference will definitely signify a mistake that will be corrected. The website has to strike a balance between profit making, customer attraction and customer satisfaction and this is definitely a game of the odds. It is amazing how William hill politics has been able to do this exceptionally well and maintained its customer base across the world. William Hill Politics Odds: which markets are offered? William Hill has put a lot of effort in building a formidable site that offers political betting. This has developed to become a popular betting option for many gamblers. Political betting is notably easier to win so risk is quite low. The bookmaker has focused its attention on British and American General Elections but the potential to grow further is quite high. Players can bet on Irish, Scottish, European and American politics. The markets include: Next president of the United States of America ahead of the 2016 elections, US Caucuses, US primaries, EU Membership Referendum, Most Seats, Prime Minister, and To Remain in EU Vote percent, Date of Next Election and Overall Majority. These markets are practically the major political markets in the world. Efforts to expand the markets further have been hindered by some legal matters and minimal popularity of some election events but soon the markets will be bigger and better. William Hill political betting is convenient to use. The company has developed a simple homepage that is easy to navigate therefore no time wasted looking for markets deep in the website. Secondly, William hill politics has software and mobile applications that can be used in iPads, iPhones, tablets, phone and PC. The instant direct play option is also available if you want to play directly though the internet browser. Moreover, William Hill has a 24 hour customer support service which that be accessed in case one has a queries. It has Email and telephone support in addition to email the live chat option and the customer relations staffs are trained to respond quickly to your needs. The systems employed are adequate therefore the service can handle many people at a go. The William hill politics odds are cautiously developed to strike an equilibrium balance between customer satisfaction and business prosperity. The site has to advertise itself and its services by luring masses through high odds. The incorporation of Scottish, Irish and other European markets to boost the presence of the old American and UK politics has also worked in favor of the bookmakers giving it an upper hand over its competitors. The website is also equipped with amazing features and graphics to make the betting experience worthwhile. The political betting option of the site is concentrated on the homepage meaning easy accessibility. The sports betting which is always more popular than political betting has also been properly represented in the homepage hence none undermined. This version has a variety of leagues therefore which can be utilized by gamblers to make lots of money. In addition, William Hill has focused its attention to the online bookie which is much more popular than the olden live casinos. You can play at the comfort of your house with minimal distractions and the reference material to help you win big. Political betting has turned out to be very lucrative and it seems to be competing strongly with sports betting, Super bowls and the likes. William hill odds well prepared for the gamblers to win. Betting on politics is also quite easy to win compared to other betting markets therefore this is the chance to be rich and William Hill is just the site to visit.